The apartment measures 60 m² and is ideal for couples or families with one child. It has a spacious living area (upholstered furniture with sleeping function, flat screen TV, stereo, dining table, fireplace), an open kitchenette (electric stove with oven, refrigerator with freezer, dishwasher, microwave, div. Kitchen appliances), a bedroom (double bed) and shower / WC. Furthermore, there is a balcony with lake view. 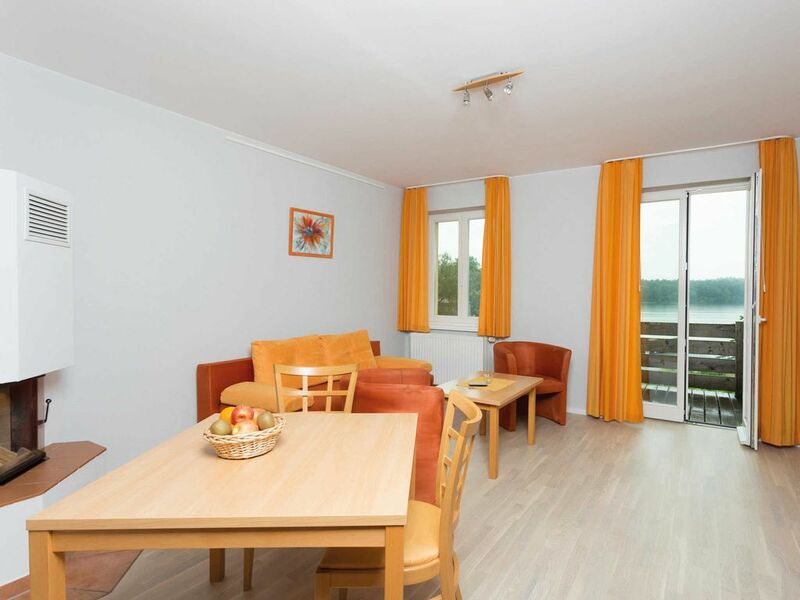 Directly on the Grienericksee lake, about 500 meters from the Rheinsberg castle park, on a plot of approx. 100 sqm with its own wellness area, is the holiday complex with a total of ten separate apartments of different sizes for two to six people. They are comfortably equipped (seating and dining area, kitchen, partly with fireplace, flat screen TV, wireless), accessible by an elevator and all have a balcony or terrace. Terrace with lake view. The exact description can be found in the object category. (Breakfast can be booked for a fee.) On the property are available: in-house boat bridge, a fish pond with cozy reading corner, Liegewiese, sandpit, table tennis table, enough space for playing, barbecue place for barbeque, bicycle shelter and parking spaces. In the own wellness area, several saunas or massage treatments (reservation required) can be used for a fee. Also: rental of bicycles (6 EUR / wheel / day) and use of the laundry room with washing machine and dryer. The total price includes: final cleaning, bed linen, towels, water and energy. To be paid on site: Tourist tax, breakfast (9 EUR / pers./ Day, children half price), pet (if applicable, 5 EUR / w), sauna use (5 EUR / pers / day), massages, bicycle rental. In this object is the transport of pets except in the apartments of the 2. Upper floor (5 EUR / pers. On site). The pets must be registered with the booking. If a booking note is not possible, an after-registration must be made. Please note the breed when booking. Sehr gepflegte, ruhige Wohnung und Anlage mit tollem Seeblick und nah anmelden Zentrum. The small town of Rheinsberg is a state-approved resort in the middle of the beautiful Rheinsberg lake landscape in Brandenburg. The region impresses with countless lakes, which are connected by canals. An ideal holiday destination, not just for water hikers. By the Prussian Crown Prince Frederick, Century in the Rococo-Castle in Rheinsberg, the place became a thriving, cultural center and inspired among others Kurt Tucholsky and Theodor Fontane. Today the chamber opera festival and other music events take place every year on the grounds of the Schloss, which also include a theater, the chamber opera and the Kurt Tucholsky Museum. In addition to the picturesque old town with numerous restaurants and cafés, guests can enjoy boat trips, boat and bicycle rental, as well as a bathing establishment at Grienericksee to the visitors' magnets in the village. The distance to Berlin-Copenhagen is 20 km.